A massive exclusive interview with Palace cult hero Julian Speroni who has been here nearly as long as FYP. He looks back over those 13-and-a-half years, talks about working his way back into the team and tells us who the best outfield player to go in goal was. Another exclusive with Gary Issott Academy Director who also been at Palace almost as long as FYP. He tells Matt Woosnam about his 13 years at the Eagles and the challenges in getting talented kids into the first-team. We remember Attilio Lombardo 20 years since he joined the Eagles basically so we could use the Gazzetta style front cover too. A look at the future under Roy Hodgson and we try to work out where we'd be now is Frank de Boer was still in charge. We call out Brighton and Hove Albion for some untruths in their statement after the fan troubles at the Amex last month. We also look back over 50 issues of FYP and at 2002/3; the season when it all started for us. 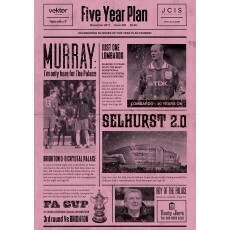 Please note this is an electronic download version of the fanzine.